Plane firmly clasped in callused hands, a Galkan craftsman shaves back the wooden surface of his current work in progress, each measured stroke sending a curled flake of wood spiraling down to the ground. The harp is yet to be strung and the body as yet unpolished, but before the day is done it will transform into an instrument worthy to be played by the most celebrated bards at any royal court. With unflinching focus, the instrument maker known as Delicate Hands toils away inside his workshop tucked away in a quiet corner of town. Specks of white floating nonchalantly by the window break his concentration, and he pauses to gaze out at the leaden sky. "Looks like we're in for a bit of snow." "You serious, sir? Gosh, I hate the cold..."
"That's funny. I don't recall taking a whiny little milksop under my wing." "You're just too thick-skinned, sir." Arlyn, a Hume boy of little more than half a score years old, apprenticed to Delicate Hands, playfully retorts. "Isn't that right, Lulumo?" He adds, appealing for the agreement of his pet opo-opo now lounging about on the nearby chair. In response, Lulumo rolls his lustrous eyes of ebony once, twice, before dealing Arlyn an affectionate cuff on the head. "Gahaha! He's telling you to get back to work." Delicate Hands does not attempt to hide his amusement. "I'm working, I tell you! In fact, I've already finished. See?" Taking the freshly strung harp presented to him by his apprentice, Delicate Hands draws close his eyes as if in meditation, and proceeds to try out each string with a gentle yet firm pluck of his stocky forefinger. A succession of notes resounds sweetly throughout the workshop. "Not bad. Not bad at all," states Delicate Hands, but his crestfallen expression betrays his true sentiments. A dejected sigh follows. "But this isn't it, either. Not the sound we're after." With his talent for crafting, Delicate Hands has over the years given life to myriad instruments which have gone on to fill the world with wondrous songs that soothe the heart and invigorate the soul. It is universally accepted among the close-knit circle of instrument makers across the two central continents that not a sound exists that cannot be reproduced by an instrument crafted with his master touch. But to this day, one sound eludes Delicate Hands still—the voice of the stars. Smilebringer legends speak of a voice, soft as a whisper, that can be heard each time a shooting star traces a luminous line across the night sky. Ever since chancing upon this tale, Delicate Hands has been chasing the dream of creating an instrument that could reproduce that very same voice, with naught but his imagination to guide him. Two solid knocks sound from the wooden door of the workshop. Three powerful strides see the Galkan craftsman to the door. He opens it, allowing the outside chill to sneak inside to set the hearth's fire astir. The visitor is a delivery moogle, his breath steaming in the cold winter air. Without so much as a word of greeting, he thrusts towards Delicate Hands a small parcel, and with it, a parchment appearing to be a bill. "Arlyn. What is the meaning of this?" Disbelief spills out from Delicate Hands, his voice quivering. The exorbitant sum, though penned in a hurried hand, is unmistakable on the bill bearing the crest of the Brugaire Consortium. The arrival of that bill brought with it many sleepless nights at the workshop, as both master and apprentice toiled away without cease in order to raise the funds necessary to settle the account. It was on the eve of the Starlight Celebration when, exhausted, Delicate Hands finally collapsed. The instrument maker wakes in the black of night to find himself burrowed deep within the blankets of his bed. The roaring fire in the hearth has dwindled to a few glowing embers struggling for life. The blurriness in his vision subsiding, Delicate Hands makes out the silhouette of his apprentice doubled over the bedside, having himself succumbed to fatigue while watching over his resting master. Lulumo is curled up into a compact ball atop his favored chair, his plush fur undulating with each breath. The peacefulness of it all brings something reminiscent of a smile back to Delicate Hands' tired face. He catches glimpse of an object carefully placed by his pillow—a handbell of simple construction describable only as a tarnished metal cup attached to a well-worn wooden handle. Mindful not to disturb the slumbering Arlyn, he pushes himself up into a seated position with his back resting on the headboard, grimacing ever so slightly as his aching body protests the movement. A brief moment of hesitation passes before Delicate Hands' curiosity wins over. He takes the handbell, its chilled handle greedily absorbing the warmth of his hand, and with a decisive flick of the wrist, sends forth a cheerful flurry of jingles which melts back the silence that had settled upon the workshop. The jovial richness of the sound lingers on within the instrument maker long after quietness returns to the grayness of the room. Several seconds tick by on the wall-mounted clock before he realizes he has been holding his breath. "You're awake, sir." Roused by the handbell's ringing, Arlyn lifts his head up from his makeshift arm pillow and lets loose a teary-eyed yawn. "Arlyn. This is the thing you ordered?" "Aye, sir. I was told of how smilebringers would come from the frozen north bearing such handbells, and thought you'd want to hear their sound for yourself." These ingenuous words drain from Delicate Hands all the anger that had assailed him but a few days ago, leaving him with only the unpleasant sting of remorse for having scolded his apprentice so harshly. "I see. You do realize, though, that that's likely to be naught but a fairytale?" "What!?" Arlyn cries out, incredulous. "You know those Brugaire Consortium types. They wouldn't scruple to concoct a fanciful tale to offload whatever contraband they've acquired." "But, but..." The sentence is left unfinished as, without warning, Arlyn's limp body crumples across the bed. "Arlyn? What's the matter?" An instinctive palm on the boy's forehead tells of a raging fever. "Hm, seems like as good a time as any to relinquish the bed." Delicate Hands tucks his indisposed young apprentice into bed in his place and dabs off the beads of sweat that had formed on the boy's forehead. His mind wanders back to the handbell. "That an instrument of such humble origin could be what I've been seeking all these years..." His voice is serene, like that of a long-unfulfilled soul who has finally attained closure. With fire burning anew in his eyes, Delicate Hands throws on his workman's apron. There is time still. Time to experiment and fine-tune, and then produce dozens—hundreds, even—of handbells that would imbue a sense of peace and happiness within the hearts and minds of all who heard their ringing. As though sensing a change in the air, Lulumo stirs and casts an inquisitive glance at the craftsman. "Good timing. Come give me a hand." With an affable screech, the opo-opo stretches, then sleepily hops over to where Delicate Hands is picking out the materials needed to fulfill his newfound mission. And that is how this handbell here came to be. So, what's your honest opinion of the story? Do you think it's something that would pique the interrrest of the Vana'diel Tribune's editor in chief? Hm? You'd like to have this handbell, you say? You're the first perrrson who's asked such a thing after hearing the story, you know. How could I possibly deny the request, seeing how much of an imprrression the tale's left on you? It's all yours. May it bring you joy and happiness, as it has for me. Thank you, kind adventurer, and Merry Starlight! 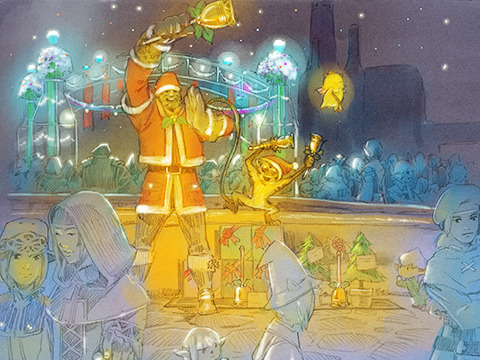 The Starlight Celebration will begin at midnight on Friday, December 19, 2008 (PST) and continue until 7:00am on Wednesday, December 31, 2008 (PST). Lend the Moogles a Capable Adventurer's Hand! Presents in Exchange for Destructive Behavior! To show their appreciation to all the tireless adventurers out there doing their part to make Vana'diel a better place, the moogles have prepared a whole hoard of presents and scattered them all over the locations listed below. As a precautionary measure to ensure that none of the creatures prowling the wilds can get to them, the presents have each been sealed within a box...and there's only one way to get them out! The Gift of a Child's Laughter! During the event period, smilebringers will be handing out presents to all the children in town from the locations listed below. Won't you help them make the children's dreams come true?